FOUR in ten UK drivers admit breaking the speed limit in 20mph zones by at least 10mph, with a fifth (21 per cent) saying they do so on a weekly basis. 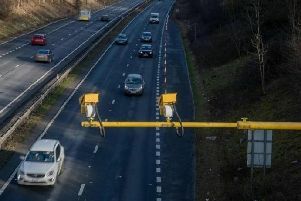 The figures were revealed in a survey by road safety charity Brake and insurer Direct Line which looked at motorists’ attitudes to the reduced urban limits. It found that 40 per cent of drivers said they sometimes travelled at more than 30mph in a 20mph zone. More than a quarter (26 per cent) said they did so at least once a month, with 21 per cent saying they exceeded the limit at least once a week. Many of the 20mph limits are imposed around schools to make walking and cycling to school safer for children. Trials in Cheshire and Scotland found that where 20mph limits were in place pedestrian and cyclist casualties fell by between 36 and 42 per cent. Alice Bailey, campaigns advisor for Brake said: “All parents want to know their children are safe while travelling to and from school and playing outdoors. Speed limits are in place to keep all road users safe and if tragedy strikes and a child is hit by a car, the speed at which it is travelling could be the difference between life and death. “20mph limits benefit our communities in so many ways, keeping them safer, cleaner and greener; when limits are lower, many more people choose to ditch the car completely and walk and cycle instead. Rob Miles, director of car insurance at Direct Line, added: “Adhering to the speed limit is such a simple way of helping to make our roads safer and is within all drivers’ gift.